The Sony PCM-D50 is small, but not quite cute and palm-sized like the Marantz PMD620 or the Edirol R09. Its aluminum body feels solid and substantial. 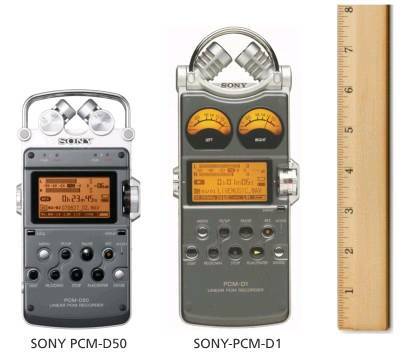 If you feel that most other recorders are too small and light to take seriously, the Sony PCM-D50 is your answer. The PCM-D50 is 1.5 inches shorter than the PCM-D1, but has virtually the same control button layout, so it gives the impression of being a little crowded. Adding to this impression are additional tiny, external controls for the A-B loop, digital pitch control, mic attenuation, limiter and low cut filter functions. Choosing options with buttons and switches is indeed more convenient than sorting through a file/menu tree, but the tiny button syndrome effect is a little overwhelming at first. Not a deal-breaker, though. The orange screen with black lettering is large and legible - the same size as the one on the PCM-D1 - but actually not quite as legible as the smaller Marantz PMD620 screen. We wish it had a contrast control in addition to the back light button. The output volume and record level dials are made of plastic and are much less precise than the ones on the PCM-D1. However, all of the buttons are crisp and very responsive. Like the PCM-D1, the back of the PCM-D50 has a threaded hole for easy tripod mounting. This is a fairly skimpy list. It would have been nice to include a pouch or carrying case. Ours already has a tiny scratch. The unit has a slot for a wrist strap, but Sony doesn't provide a strap! Optional accessories include the sturdy LCPCMD50G carrying case, the RM-PCM1 wired remote control, the VCT-PCM1 tripod and the cool AD-PCM1 hairy-style windscreen. The PCM-D50 is easy to use. Not quite as effortlessly intuitive as the PCM-D1 (we actually had to consult the manual for a few minutes) but not complicated either. If you've ever operated a recording device of any kind and are comfortable with the file/menu interface on a computer, you will not have a problem using the PCM-D50. Favorite feature: Divide tracks during recording AND playback with the DIVIDE button on the front of the unit. No digging through file menus to find the divide function. This is on the PCM-D1 too. Check out the Sony PCM-D50 brochure for more technical information. The Sony PCM-D1 comes with 4GB of built-in compact flash storage. You can double your memory capacity with Sony's proprietary memory stick PRO media in the slot provided. Since most other flash recorders can now accept 8GB cards and higher, Sony is no longer the leader on this issue. An 8GB SD card is roughly the same price as a supplemental 4GB memory stick pro. The PCM-D50 has a usb mini port and 1/8" headphone and line-out outputs and 1/8" remote, mic and line-in inputs. The line-in and line-out connections are offered in analog and optical. You can also use external mics with balanced XLR connections by connecting the PCM-D50 to the optional XLR-1 adapter. Outstanding. Almost unbelievable. The PCM-D50 lasted more than 25 hours on one set of alkaline batteries during our battery life test. Yes, more than a day. The PCM-D50 microphones are significantly smaller than the ones on the PCM-D1, but we like the fact that they are adjustable (from X-Y to wide angle) rather than fixed in X-Y like the PCM-D1. Sound quality is very good. To our ears, the Sony PCM-D50 is clean and detailed, but a bit edgy in moments that would be taken in stride by the smooth and confident PCM-D1. 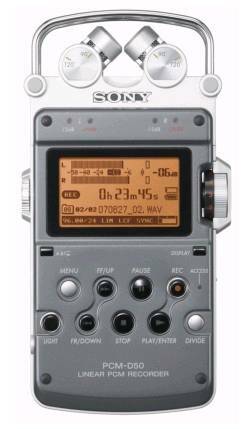 Nonetheless, it sounds better than most other handheld recorders on the market and its price is nearly 70% less than the PCM-D1. As always, this is ultimately a matter of personal taste and budget. Check out our sound samples and decide for yourself. 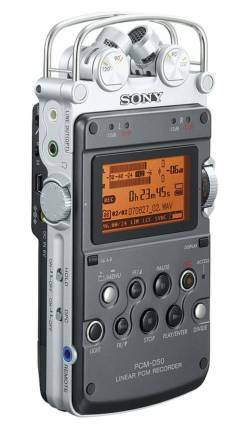 The Sony PCM-D50 is a very good, high-quality handheld recorder. 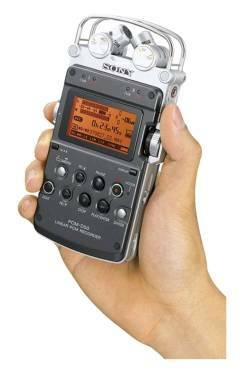 It sets a new standard in the under-$500 category and is a welcome addition to our line up of portable recorders.